Join The Finger Lake’s own, Whiskey Tango Sideshow and over 20 unique special guests from across the nation and beyond for two nights of dazzling “adult-oriented” entertainment at the beautiful Hangar Theatre in Ithaca N.Y! 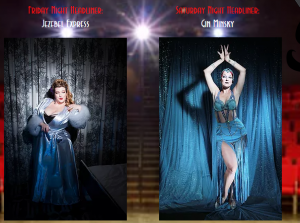 Featuring special guest headliners: Jezebel Express (NYC) on Friday Night and Gin Minsky (NYC) on Saturday Night! Plus the debut performance of Whiskey Tango Sideshow’s own Bourbon Babes on Friday night! PLUS a variety of vendors selling everything from handmade rhinestone pasties, makeup, jewelry, belly dance wear and accessories, makeup and MORE plus giveaways, raffles and prizes throughout the festival!